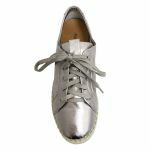 Hildur by Django & Juliette is a flat lace-up sneaker. You would wear Hildur casually with any day time outfit. Hildur has a padded removable insole and adjustable laces. Hildur has wide oval toe but an average fit across the width of the foot. Hildur has a built-up treaded sole, perfect for travelling and being on your feet all day. 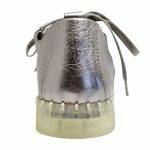 Hildur is made of loft half-lined leather meaning it will stretch easily to the shape of your foot.